New Perspectives Pole and Aerial is a pole dance studio in Manchester, NH. 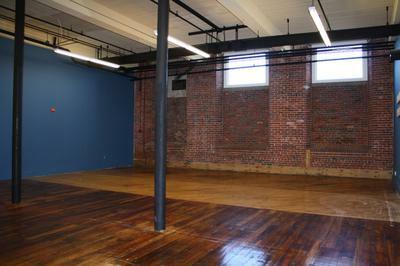 Our studio is located inside the fully renovated Waumbac Mill, with 12'10" chrome poles. We also offer aerial silks, Aerial Hoop, handbalancing, flexibility and strength classes! Our classes range from beginner through advanced, offering training for people who wish to compete as well. You can view our website at www.NewPerspectivesNH.com or send us an email at Juel.Sheridan (at) gmail.com. Our pole instructor and studio owner has been training in pole for the past two years. Prior to pole dancing, she was both a rhythmic and artistic gymnast. She coached both at the competitive and recreational level. Her love for gymnastics inspired her to start pole and she immediately fell in love. She has competed several times, placing third in her first competition. Recently, she started competing at the professional level. She also teaches the hand balancing and flexibility classes. Prior to teaching pole, she obtained her Master's degree in Health Education and Coaching from Boston University. Fitness and health has always been one of her passions and she looks forward to sharing that with others around her. Our aerial silks and hoop instructor has been dancing her entire life, and took up aerial when she attended the University of New Hampshire. She has performed in several aerial dance shows and has trained with some of the top aerialists in the country. We currently offer classes six days a week in both the daytime and the evening to fit your schedule. At this time, we do not offer classes on Sundays but may in future if there is demand for it. Parties can be scheduled at your convenience, but they are scheduled on a first come, first serve basis so schedule early to guarantee your day and time! Please feel free to contact us with any questions, concerns, or requests. We do our best to accommodate everyone's needs and we hope to see you in the studio some time!